The government's planned cap on migrant numbers could hurt the UK's car manufacturers, the industry's trade body has warned. The Society of Motor Manufacturers and Traders (SMMT) said the cap could hurt global companies, like carmakers, that operate in the UK. 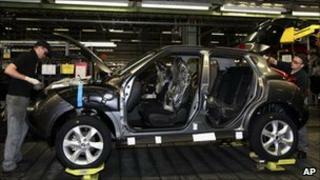 Meanwhile the society reported a 37.3% rise in car production in August compared with the same time last year. A total of 77,882 cars were made in the UK last month. Total vehicle numbers, which includes commercial vehicles, rose to 83,767. The SMMT's chief executive Paul Everitt said the figures showed that UK vehicle and engine production was leading "a strong manufacturing recovery". But speaking to the BBC he admitted that the rise in production this year was being compared with significantly reduced production in 2009. Last year, many car makers were forced make big cut-backs as the worldwide demand for cars collapsed. "There are still significant challenges ahead and the government must do all it can to encourage continued international investment in UK-based [research and development], skills, plant and machinery," Mr Everitt said. Earlier he called for the government to ensure that the planned cap on immigrants into the UK would exclude transfers of staff within companies. Car makers including Nissan, Toyota and General Motors operate plants in the UK, and the SMMT is concerned that such a cap could prevent them moving staff to the UK from their plants in other countries. "We're a global business so very often we have highly skilled people working within companies - both vehicle manufacturers and indeed their suppliers who are operating in a different part of the world and need to come to the UK to transfer their skills and knowledge that they have to our UK facilities," he told the BBC. "The arbitrary cap and the way in which it might include intra-company transfers risks some serious unintended consequences." He added the UK would not get the direct benefit of those highly skilled individuals and that firms which had invested over a long period of time would find it hard to understand why their senior and experienced executives were not able to get into the UK." "Highly skilled employees transferred to work within the UK automotive industry are essential to maintaining and improving our global productivity and competitiveness," Mr Everitt said. He added that if intra-company transfers were included in the cap, it would "impact on the attractiveness of the UK as a location for inward investment and undermine the UK's role in an increasingly global economy". The government's Minister for Immigration, Damian Green, said migration policies would be developed in conjunction with businesses to ensure that "Britain remains open for business". "We will continue to attract the brightest and the best people who can make a real difference to our economic growth," he said. "We have consulted with business... on how the limit should work and have also asked the Migration Advisory Committee to consult on what the actual limit should be." The findings of the consultation would be announced in due course, Mr Green said.